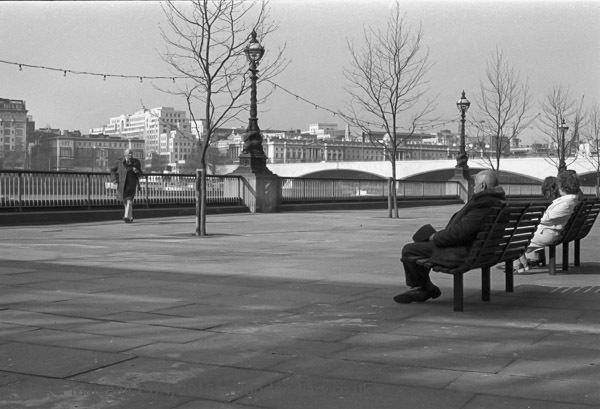 I find it hard to think back and imagine the first time I came to London with a camera, and have little memory of the occasion. What I do have is two contact sheets (and the corresponding Tri-X negatives) but the only information outside of the images are the file letters, 3k and 3l, probably assigned at a later date. In my first few years of learning to be a photographer I tried to keep images from different types of subject in different files, and the ‘3’ seems to have been a general photography file, including sports, portraiture, theatre photography and more, with negatives and filing sheets at some point assigned the letters a-z in what now appears to be a fairly random order. At the time I took relatively few photographs and didn’t feel the need for much of a system, though file ‘4’ seems to have been reserved for my pictures taken in Europe. Fortunately it wasn’t too long before I saw the error of my ways and began to file my black and white negatives in order of taking (or at least of processing) and, since April 1986, under the year and month of taking. Of course things are much easier with digital where everything comes with EXIF metadata. Probably anyone with access to a newspaper library would be able to fix the date more precisely, as several of the pictures show the remarkable ‘Golden Hinde II’, a remarkable reconstruction of Sir Francis Drake’s galleon in which he circumnavigated the globe from 1577-1580, moored at Sugar House Quay next to the Tower of London, with crowds waiting to board. 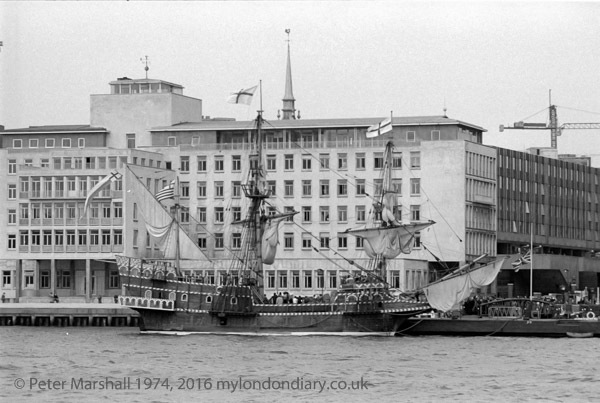 The ship, usually known as the Golden Hind, was launched in Appledore, Devon in April 1973, although its ‘maiden voyage’ was only made from Plymouth in late 1974. At some stage before this it came to London where I photographed it. Around this time I had just bought an Olympus 35SP to replace one of two Russian cameras I had been using. It seems likely that these images were taken just a few days before this arrived, as the last 9 frames of the second film show this in various images, including one close-up of the viewfinder which shows the rather dull view from our first-floor Bracknell flat from which we moved in August 1974. 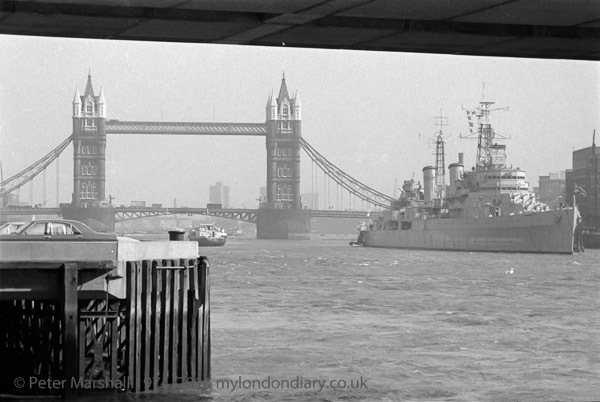 From the trees in several of the London images, they were clearly taken in winter, and so the pictures must date from either late 1973 or early 1974. The pictures will have been made using a Zenith B, a sturdy, tank-like Russian SLR. The ‘B’ model came without the built-in exposure meter of the ‘E’ but was available with the superior 58mm Helios f2 lens (of pre-war German design) and on the page linked – where it is the fifth camera down – I see that the type I used is now “very rare to find”. I will have been using a handheld Weston Master V exposure meter, which had a large selenium cell, and came with a curious white plastic ‘Invercone‘ to enable incident light readings. Made in Enfield in north London – or rather ‘Middlesex’, these were incredibly reliable, needed no battery and had only one real fault – the wafer-thin glass above the needle, which was easily broken as the meter dangled free from its cord around your neck. After several expensive repairs I cut and glued some rather thicker perspex on top of where the glass should have been. 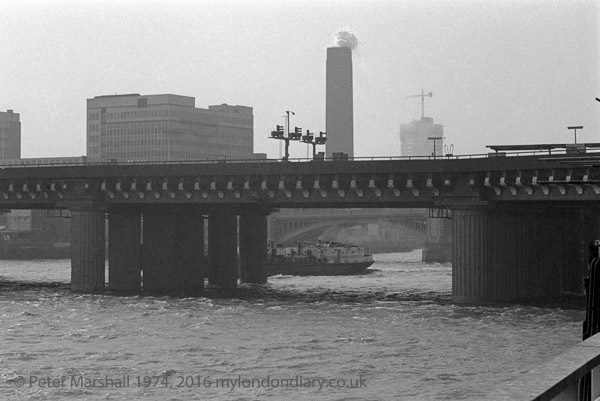 As well as the ‘standard’ 58mm I also had with me another Russian lens, a telephoto, probably the 135mm Jupiter f4, copied from the Carl Zeiss pre-war Sonnar. Photography with this equipment was rather slower than with modern cameras, but it was probably more the cost of film that kept the number of exposures made during the day to 49 – and explains why there are no real duplicate images. Two frames are hopelessly over-exposed, probably because I forget the need to manually stop down the lens to the taking aperture after focussing. Two are ruined by slight fogging, a consequence of loading film into cassettes from bulk with a bulk film loader to cut costs. One is sadly out of focus, rushing to get a picture, and a few seem rather ordinary – such as two pictures of St Paul’s Cathedral. 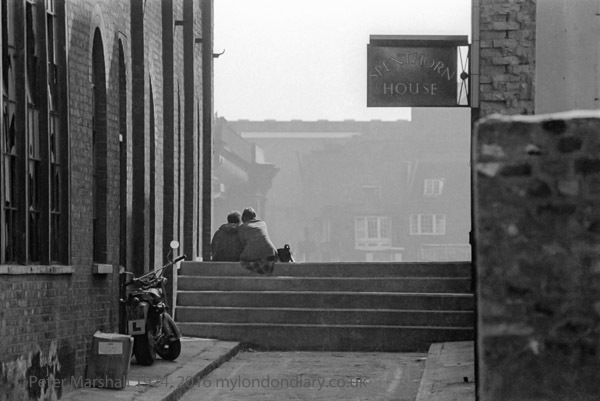 There are also no really great images, though most have some interest, some rather more than when they were made because of the changes since they were taken – little smoke now emerges from Bankside Power Station. 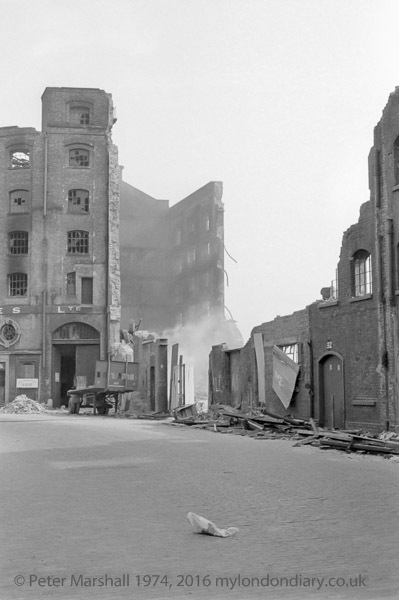 But there was one picture which I think became very important to me, of warehouses being demolished on the riverside beyond St Katharine’s Dock, which is really the only one of these I remember taking, and which prompted me to begin to explore London’s disappearing docklands. See these and the rest at My First Day with a camera in London. This entry was posted on Sunday, May 29th, 2016 at 11:36 am and is filed under My Own Work, Photo History. You can follow any responses to this entry through the RSS 2.0 feed. You can leave a response, or trackback from your own site.